The authors describe a patient with recurrent perineurioma arising in the subcutaneous tissue of the dorsal forearm and extending along the forearm fascia. Soft tissue perineurioma is a rare, originally benign peripheral nerve sheath neoplasm arising from the perineurium, a protective cell barrier surrounding the individual fascicles in peripheral nerves. Perineurioma has only recently been recognized as an entity distinct from other nerve sheath tumors, such as schwannoma and neurofibroma, with unique morphologic, ultrastructural, and immunoreactive features. The recurrent tumor had converted into malignant perineurioma, defined as increased nuclear pleomorphism and cellularity. The ill-marginate feature extending along the fascia required wide resection, leaving a substantial defect on the distal forearm. Surgical repair of large forearm skin defects is challenging because of limited skin extensibility for flap creation, the prominence of the site in terms of aesthetic outcome, and the risk of damage to extrinsic muscles that control delicate hand movements. The reverse forearm adipofascial flap, which was based on distal perforators of the radial artery, was suitable for the current case to cover the exposed myotendinous junctions of the forearm extensor muscles. This flap did not sacrifice skin, a major vessel, or skeletal muscles, and preserved function at both the donor and the recipient sites. The texture of the graft was similar to that of the surrounding skin. The clinical and histopathologic features of this rare tumor are also described to aid in the differential diagnosis and as a reference for surgeons who treat soft tissue neoplasms and may encounter this type of soft tumor. The authors are from the Department of Orthopaedics (MT, TK, TN, MT, KS) and the Department of Human Pathology (HE), Institute of Health BioSciences, University of Tokushima, Tokushima; and the Department of Pathology (TH), Tokushima Prefectural Central Hospital, Tokushima, Japan. Correspondence should be addressed to: Mitsuhiko Takahashi, MD, Department of Orthopaedics, Institute of Health BioSciences, University of Tokushima, 3-8-15 Kuramoto, Tokushima 770-8503, Japan ( w-tk@umin.ac.jp). Surgical repair of large forearm skin defects is challenging because of limited skin extensibility for flap creation, the prominence of the site in terms of aesthetic outcome, and the risk of damage to extrinsic muscles that control delicate hand movements. Thus, even soft tissue reconstruction covering the forearm can result in a poor functional and aesthetic outcome. Soft tissue perineurioma is a rare nerve sheath tumor of variable anatomic location, occurring predominantly in adults.1,2 The authors report a patient with recurrent perineurioma arising in the subcutaneous tissue of the dorsal forearm and extending along the forearm fascia. After curative tumor excision, a reverse adipofascial flap with skin graft proved successful for reconstruction. The recurrent tumor had converted into malignant perineurioma. The clinical and histopathologic features of the tumor are described to aid in the differential diagnosis and provide a reference for surgeons who treat soft tissue neoplasms. A 66-year-old man was referred to the authors’ institution with a recurrent painless lump in the left dorsal forearm. The patient was initially treated with marginal excision of the subcutaneous mass at a local clinic. Pathologic examination at that time suggested a soft tissue perineurioma with borderline malignancy. Additional wide resection was advised to avoid local recurrence or metastasis. However, the patient underwent no further treatment and the tumor recurred approximately 1 year later. The recurrent tumor was a subcutaneous lesion approximately 5 cm proximal to the distal radioulnar joint on the dorsal aspect of the left forearm near the muscle-tendon junctions of the extensor digitorum and extensor carpi ulnaris. On palpation, the tumor was rubbery, with a smooth surface. It was found to adhere to both the forearm fascia and the overlying skin. Magnetic resonance imaging scan showed a poorly marginated lesion (approximately 4.0×3.5×1.5 cm) extending along the outer surface of the forearm fascia and covered by thinned skin (Figure 1). 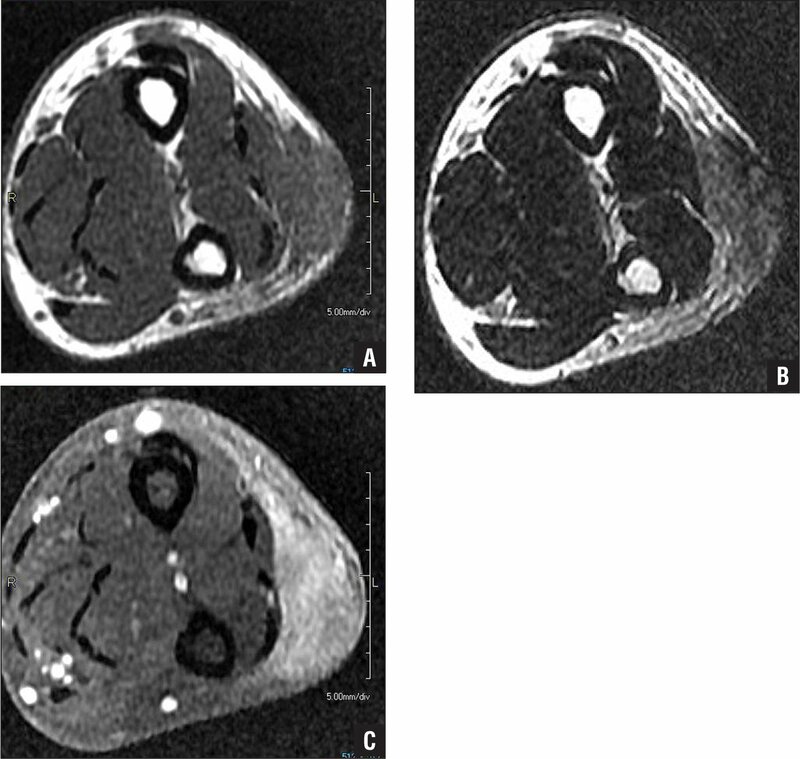 Preoperative axial T1-weighted (A), T2-weighted (B), and contrast-enhanced T1-weighted fat-saturated (C) magnetic resonance imaging scans of the left forearm. The tumor was excised en bloc with a surrounding margin of approximately 1 cm, including the overlying skin and forearm fascia (Figure 2). As a result, the fascial defect extended from the brachioradialis muscle to the edge of the ulna. A distal-based radial forearm adipofascial flap was created from a curvilinear skin incision between the brachioradialis and flexor carpi radialis muscles on the volar forearm by peeling bilateral skin with a minimal amount of subcutaneous tissue. The raised adipofascial flap was approximately 15 cm long and 6 cm wide. The flap was rotated radially and passed beneath the subcutaneous tissue to cover the dorsal defect. The volar donor site was primarily closed. Sufficient circulation was maintained in the flap, and a full-thickness skin graft from the groin with a tie-over dressing was placed over the flap. The postoperative course was uneventful, and the tie-over was removed approximately 2 weeks after surgery. The donor site healed by 3 weeks after surgery. Eighteen months later, the texture of the graft was similar to that of the surrounding skin except for a slight difference in pigmentation (Figure 3). Full range of motion and muscle strength of the left hand were preserved. Surgical exposure of the left dorsal forearm after tumor excision. The distal radius and ulna were marked on the skin. The extensor tendons are exposed. 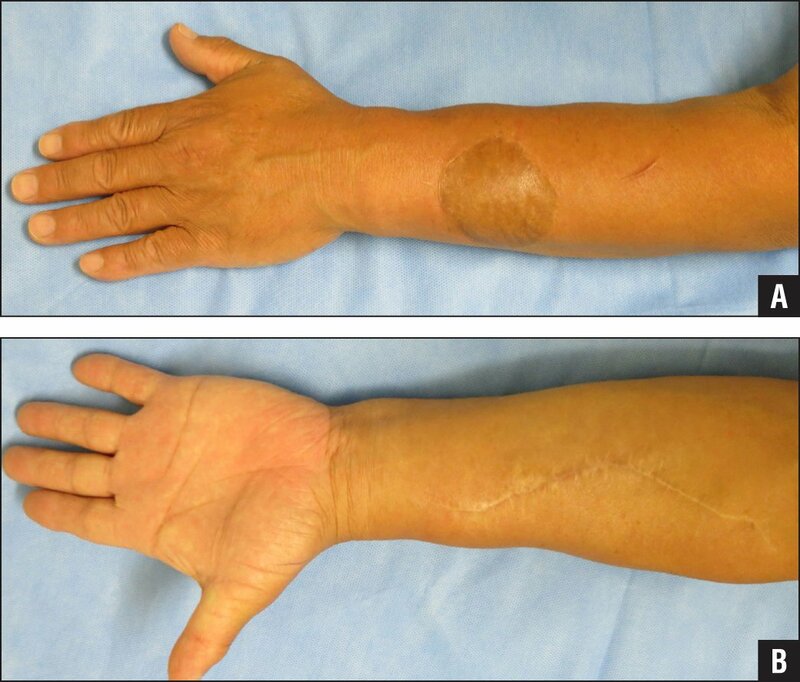 Aesthetic appearance of the dorsal recipient (A) and volar donor (B) sites of the left forearm 18 months after adipofascial flap surgery. The excised tumor was well circumscribed grossly, but was determined not to be encapsulated microscopically. 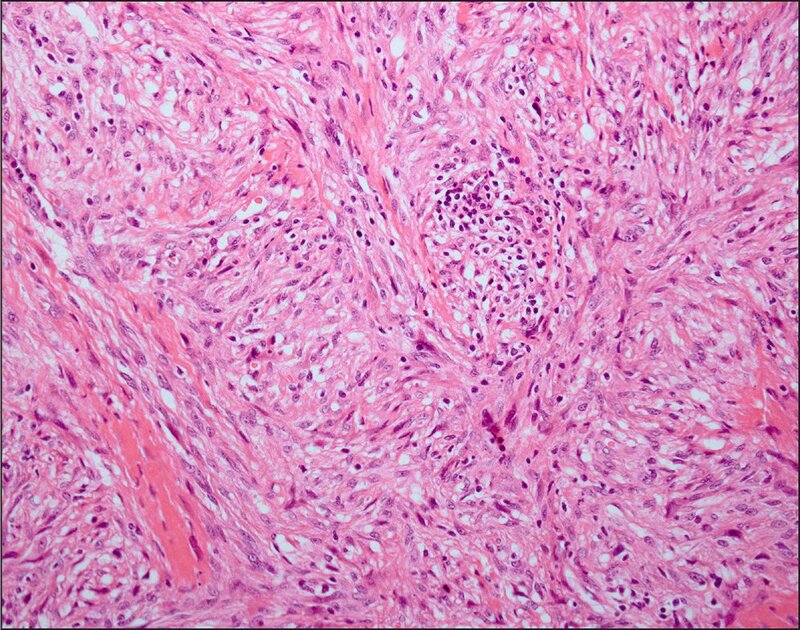 Tumor cells infiltrated into parts of the surrounding subcutaneous tissue. The tumor exhibited a predominantly storiform and fascicular architectural pattern, with collagenous stroma (Figure 4). Most of the tumor cells were of uniform appearance, with oval nuclei, among which were scattered pleomorphic cells. Nodular lymphocyte infiltrations were observed in some regions. Tumor cells were positive for the human erythrocyte glucose transporter-1 but not for CD34, type IV collagen, epithelial membrane antigen, the tight junction-associated protein claudin-1, S-100, or alpha-smooth muscle actin. Compared with a histologic section from the initial excision, the recurrent tumor showed increased nuclear and cellular pleomorphism as well as increased cellularity, although the MIB-1 index was nearly the same (∼10% MIB-1-positive for both tumors). The final diagnosis was malignant perineurioma. Neither recurrence nor metastasis of the tumor has been detected on follow-up magnetic resonance imaging scan or chest computed tomography scan as of 2 years after surgery. Hematoxylin and eosin staining of the recurrent tumor, showing the storiform growth pattern and nuclear atypia often seen in malignant fibrous histiocytoma (original magnification ×100). The tumor stroma contains fine collagenous bundles and inflammatory cells. Several reports recently documented successful reconstruction with reverse forearm adipofascial flaps.3–6 All of these flaps were based on distal perforators of the radial, ulnar, or interosseous arteries. These perforators provide a rich vascular network on the forearm fascia and thin subcutaneous tissue to supply the superficial component.7,8 These flaps have generally been used for skin repair on the dorsal hand, where a very thin subcutaneous tissue covers the extensor tendons and metacarpal bones. The current case was the first to use a reverse adipofascial flap for reconstruction of an ipsilateral forearm defect. 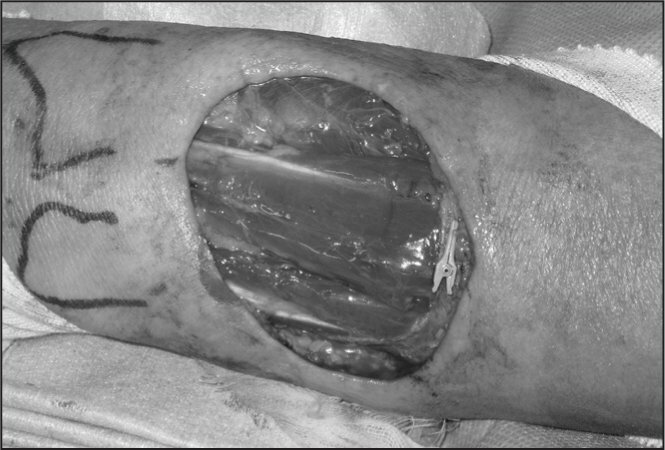 In the current patient, excision of the tumor exposed the myotendinous junctions of the forearm extensor muscles and required a substantial flap to cover the defect site where the subcutaneous tissue originally had been thin. The aesthetic outcome was satisfactory, with the texture of the skin graft resembling that of the surrounding normal skin, but with lighter pigmentation. There are 2 main types of perineurioma: intraneural and extraneural (soft tissue). The latter type is relatively more common and presents as a painless solitary nodule or mass within soft tissue.2 The current case was classified as the latter type and may be encountered by orthopedic surgeons or plastic surgeons. The differential diagnosis of soft tissue perineurioma includes dermatofibrosarcoma protuberans, low-grade fibromyxoid sarcoma, and other nerve sheath tumors, some of which are malignant. Therefore, careful histologic examination is required. Physicians should therefore be aware of the characteristic features of these different neoplasms, including malignant perineurioma, as discussed later, to prevent recurrence and avoid unnecessary reoperation. In the current patient, histologic examination of the recurrent tumor suggested malignant perineurioma, a variant first described by Hirose et al13 that shows increased nuclear pleomorphism and cellularity. The recurrence rate of soft tissue perineurioma is not known, but there are a number of reports documenting recurrence, especially in cases of malignant perineurioma.14,15 The authors propose that the unencapsulated nature of perineuriomas is strongly related to residual tumor cells after marginal excision and subsequent recurrence. It is unclear whether the initial inappropriate resection caused malignant changes at the time of recurrence in this patient. Effective chemotherapy for malignant perineurioma has not been described. Therefore, in addition to making an accurate diagnosis, ensuring a sufficient surgical margin is critical at initial treatment for malignant perineurioma to prevent recurrence. A wide surgical margin is not necessary for benign perineurioma, but sufficient knowledge is needed to differentiate malignant and benign perineuriomas. Several reports have indicated that malignant perineurioma can recur with distant metastasis, even after a few years.14,15 Therefore, careful long-term follow-up is required. Macarenco RS, Ellinger F, Oliveira AM. Perineurioma: a distinctive and underrecognized peripheral nerve sheath neoplasm. Arch Pathol Lab Med. 2007; 131:625–636.